Upon analyzing the structure-activity relationship, it was found that coumarin-based derivatives exerted cytotoxic and antitumor activity. In the present study a new ester of α-lipoic acid and derivative of alloxanthoxyletin (LAA) was synthesized and evaluated for its anticancer activity. The structure of this new compound was confirmed by 1H NMR, 13C NMR, and HRMS spectroscopic analyses. Both, the cytotoxicity and the migration tests showed that human melanoma cells (HTB-140) and human lung cancer cells (A549) were more sensitive to LAA exposure than human normal keratinocytes (HaCaT). Moreover, LAA induced significant HTB-140 and A549 apoptosis, as evidenced by V-FITC/7-AAD flow cytometry analysis. 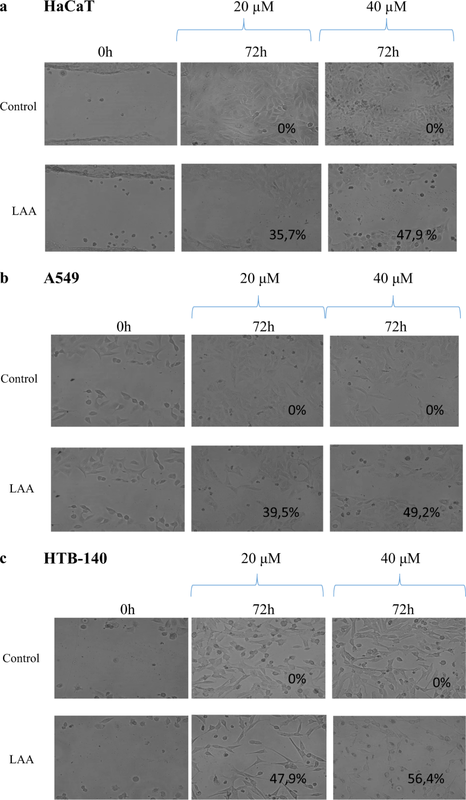 Preincubation of the HTB-140 and A549 cells with LAA increased a sensitivity of tumor cells to a drug-induced cell death. Significantly lower expression of IL-6 mRNA was observed in A549 and HTB-140 cells which were pre-incubated with LAA and then treated with doxorubicin as compared to the cells pre-incubated with LAA and then treated with cisplatin. The results suggest that the newly synthetized LAA is compound with anticancer activity promising for potential applications, but further studies are needed to gain more insight into the mechanism of action of tested derivative. Searching for new substances with anti-cancer properties is an important area of research. Several reports provided evidence that natural and synthetic derivatives of coumarins exert cytotoxic and anticancer properties (Peng et al. 2013). Alloxanthoxyletin belongs to natural and biologically active pyranocoumarins which possess anticancer activity. Recent studies have indicated that coumarin derivatives reveal their cytotoxicity by several mechanisms with regard to their structure. It was shown that they are a potent inhibitor of variety of proteins including EGFR, tyrosine kinase, ERK1/2, PI3K, HSP 90, Bax, STAT, NF-κB, and telomerase (Kumar et al. 2017). Moreover, coumarin-based agents influence the caspase-9-mediated apoptosis by arresting the cell cycle in the G0/G1 phase, G2/M the and have DNA binding ability (Amin et al. 2018). Alpha lipoic acid (α-LA) is a compound with antioxidant properties (Kaki et al. 2012). It is synthesized by plants and animals, can cross the blood—brain barrier, and is a cofactor of enzymes that play key role in cellular metabolism (Bernini et al. 2011). Alpha lipoic acid effectively scavenges free radical species and maintains a cellular oxidoreductive state (Packer et al. 1995). Recently, α-lipoic acid has attracted an increasing interest due to its suggested effect in the therapy of many diseases, including different type of cancer. It is supposed that α- LA, as well as its derivatives may protect against tumorigenesis and cancer progression (Bernini et al. 2011, Wenzel et al. 2005). Bernini et al. observed the antiproliferative properties of α-lipoic acid derivative against human colorectal adenocarcinoma HT-29 cells and showed that the inhibition of cancer cell growth, was mediated by the induction of a G2/M phase cell cycle arrest (Bernini et al. 2011). On the basis of recent studies concerning the biological and pharmacological properties of both coumarins and α-lipoic acid, our research are focused on yielding a novel molecular combinations received by joining the two biologically active compounds to obtain a more active substance. Our previous study demonstrated that some alloxanthoxyletin derivatives revealed a high cytotoxic potential against human melanoma cells (HTB-140) and human epithelial lung carcinoma cells (A549) (Ostrowska et al. 2017), therefore, we decided to investigate a novel derivative of alloxanthoxyletin. In the present study new ester of α-lipoic acid and derivative of alloxanthoxyletin (LAA) was synthesized and evaluated for its anticancer activity. The final ester (LAA) was obtained in the catalytic condensation. It seems reasonable that the synthesized LAA may comprise the biological activity of alloxanthoxyletin and its lipoic part may increase the affinity to penetrate cancer cells. Thus, it may be assumed that the tested derivative increases cancer drug sensitivity. To check this consideration we examined the effect of the tested derivative on HTB-140 and A549 cell lines with regard to their antiproliferative activities in vitro. Moreover, we aimed to perform cytotoxic evaluation of doxorubicin/cisplatin in combination with LAA in light of attenuated IL-6 gene expression. Dichloromethane, 1,4-dioxane, and methanol were supplied from Sigma Aldrich. All chemicals were of analytical grade and were used without any further purification. The NMR spectra were recorded on a Bruker AVANCE spectrometer operating at 500 MHz for 1H NMR and at 125 MHz for 13C NMR. The spectra were measured in CDCl3 and are given as δ values (in ppm) relative to TMS. Mass spectral ESI measurements were carried out on Waters ZQ Micro-mass instruments with quadruple mass analyzer. LC analyses were performed on silica gel plates (Merck Kiesegel GF254) and visualized using UV light or iodine vapor. Column chromatography was carried out at atmospheric pressure using Silica Gel 60 (230–400 mesh, Merck) and using dichloromethane/methanol (0–1%) mixture as eluent. To a magnetically stirred at 22–23 °C solution of 7-hydroxy-5′,5a′,9-trimethylpyrano[2′,3′-f]-(2 H)-chromen-2-one (derivative of alloxanthoxyletin) (0.15 g; 0.58 mmol) and α-lipoic acid (0.12 g; 0.58 mmol) in dry 1,4-dioxane:CH2Cl2 mixture (2:1, 12 mL) a BOP (0.26 g; 0.58 mmol) and triethylamine (0.12 mL; 0.87 mmol) were added. The resulting solution was stirred at 22–23 °C for 1 h and concentrated under reduced pressure. The residue was dissolved in CH2Cl2 (25 mL) and washed with 1% HClaq solution (4 × 12 mL) and distilled water (2 × 15 mL). The organic layer was dried over MgSO4 and after evaporation of the solvent under reduced pressure the product was isolated using column chromatography on silica gel and CH2Cl2:MeOH mixture (0–1% MeOH) as an eluent. The isolation by chromatography gave 0.16 g (62% yield) of ester of α-lipoic acid and alloxanthoxyletin derivative (LAA) as pale yellow oil. 1H NMR (CDCl3, 300 MHz) δ (ppm): 1.51 (s, 5’,5a’-6H), 1.53–1.64 (m, 4”-2H,), 1.70–1.78 (m, 5”-2H), 1.79–1.85 (m, 3”-2H), 1.90–1.97 (m, 7”-1H), 2.46–2.52 (m, 7”-1H), 2.59 (d, J = 1.5 Hz, 9-3 H), 2.63 (t, J = 7.5 Hz, 2”-2H), 3.11–3.22 (m, 8”-2H), 3.58–3.63 (m, 6”-1H), 5.63 (d, J = 10.2 Hz, 3’-1H), 6.06 (q, J = 1.2 Hz, 3-1 H), 6.30 (d, J = 9.9 Hz, 4’-1H), 6.64 (s, 8-1 H). 13C NMR (CDCl3, 75 MHz) δ (ppm): 24.3 (C-9), 24.6 (C-3”), 27.9 (C-5’, 5a’), 28.7 (C-4”), 33.9 (C-2”), 34.6 (C-5”), 38.5 (C-8”), 40.3 (C-7”), 56.2 (C-6”), 78.1 (C-2’), 103.4 (C-8), 108.6 (C-4a), 110.8 (C-6), 114.0 (C-3), 115.9 (C-4’), 129.3 (C-3’), 148.4 (C-7), 152.3 (C-5), 153.5 (C-4), 154.4 (C-8a), 160.3 (C-2), 170.9 (C-1”). HRMS (ESI) calc. for C23H26O5S2Na [M + Na]+: 469.1119; found 469.1112. Human immortal keratinocyte cell line from adult human skin (HaCaT), Human epithelial lung carcinoma cell line (A549), and Human melanoma cell line (HTB-140) were bought from American Type Culture Collection (Rockville, USA), and cultured in Dulbecco’s Modified Eagle’s Medium (DMEM) supplemented with 1% antibiotics (penicillin and streptomycin), and 10% heat-inactivated FBS-fetal bovine serum (Gibco Life Technologies, USA), at 37 °C and 5% CO2 atmosphere. Cells were passaged using trypsin-EDTA (Gibco Life Technologies, USA) and cultured in 24-well plates. Experiments were conducted in DMEM with 2% FBS. 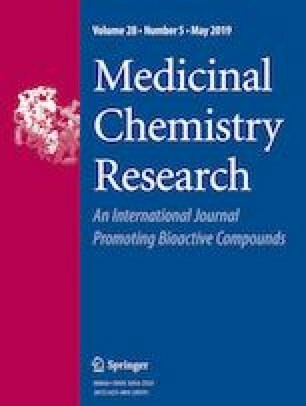 The cell viability was assessed by determination of MTT salt [3-(4,5-dimethylthiazol-2-yl)-2,5-diphenyltetrazolium bromide] conversion by mitochondrial dehydrogenase. Briefly, the cells were incubated for 72 h in 24-well plates with different concentrations of tested compounds, and subsequently for another 4 h with 0.5 mg/ml of MTT solution, which is converted in live cells under the effect of mitochondrial dehydrogenase into insoluble formazan. The converted dye was then solubilized in 0.04 M HCl in absolute isopropanol. Absorbance of solubilized formazan was measured spectrophotometrically at 570 nm (using Epoch microplate reader, BioTek Inc., USA) equipped with Gen5 software (BioTech Instruments,Inc., Biokom). Cell viability was presented as a percent of MTT reduction in the treated cells versus the control cells (cells incubated in serum-free DMEM without studied compounds). The relative MTT level (%) was calculated as [A]/[B] × 100, where [A] is the absorbance of the test sample and [B] is the absorbance of control sample containing the untreated cells. Decreased relative MTT level indicates decreased cell viability. Release of lactate dehydrogenase (LDH) from the cytosol to culture medium (cellular membrane integrity assessment) is a marker of cell death. The assay was performed after 72 h incubation of cells in 24-well plates with investigated compounds according to previously used methodology. The activity of lactate dehydrogenase (LDH) released from cytosol of damaged cells to the supernatant was measured according to the protocol of LDH test described by the manufacturer (Roche Diagnostics, Germany). An absorbance was measured at 490 nm using a microplate reader (using Epoch microplate reader, BioTek Inc., USA) equipped with Gen5 software (BioTech Instruments, Inc., Biokom). Compound mediated cytotoxicity expressed as the LDH release (%) was determined by the following equation: [(A test sample−A low control)/(A high control−A low control)] × 100% (A-absorbance); where “low control” were cells in DMEM with 2% FBS without tested compounds and “high control” were cells incubated in DMEM with 2% FBS with 1% Triton X-100 (100% LDH release). The cytotoxicity was expressed as percentage LDH release as compared to the maximum release of LDH from Triton-X100-treated cells. Cells were seeded in 12-well plates, next after reaching a 70% confluence, and a cutting line in the middle of the plate was made and the test compound was added at two concentrations of 20 μM and 40 μM (these concentrations were not cytotoxic to the cells). Cells were incubated for 72 h, and then the pictures were obtained through a microscope Nikon Eclipse TS 100. The total number of cells and the number of cells that crossed the cutting line were counted, and the percent of inhibition of cell migration as compared to control cells was calculated. Cells were pre-incubated for 72 h with the tested compound LAA at IC50 concentration. 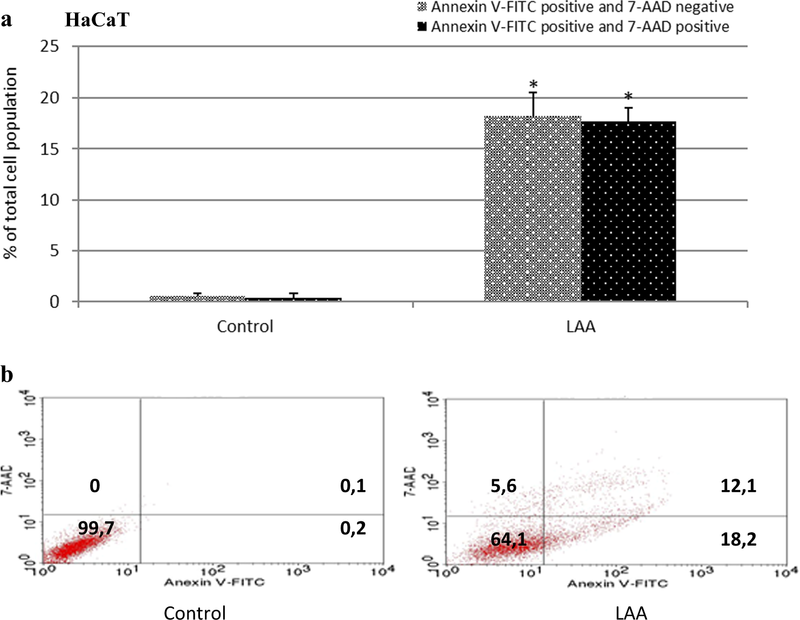 The effect of compound exposure on HaCaT, A549, and HTB-140 cells was determined by dual staining with Annexin V:FITC and 7-AAD, using the commercially available kit (FITC Annexin V Apoptosis Detection Kit I; BD Biosciences Pharmingen). Annexin V:FITC and 7-AAD were added to the cellular suspension as in the manufacturer’s instructions, and sample fluorescence of 10,000 cells was analyzed by flow cytometry (Becton Dickinson). Cells which were Annexin V:FITC positive and 7-AAD negative were identified as early apoptotic. Cells which were Annexin V:FITC positive and 7-AAD positive were identified as cells in late apoptosis or necrotic. RNA was extracted using TRIzol® Reagent (Ambion) according to the manufacturer’s instruction. RNA concentration and purity were evaluated with Quawell Q5000 micro-volume UV-Vis spectrophotometer. RNA was reverse transcribed to cDNA with High-Capacity RNA-to-cDNA Kit (Applied Biosystems). Quantitative real-time reverse transcription polymerase chain reaction (qRT-PCR) was carried out with TaqMan Gene Expression Assays (Applied Biosystems) by using the ViiA™7 Real-Time PCR System (Applied Biosystems). VIC-labeled TaqMan probe for IL-6 (Hs00174131_m1), and FAM-labeled TaqMan probe for GAPDH (Hs03929097_g1) were used. All qRT-PCR experiments were run in triplicate. The PCR reaction mix included TaqMan Gene Expression Assay, TaqMan Universal PCR Master Mix II, with Uracil-N-Glycosylase (UNG, Applied Biosystems) added to each cDNA sample or blank control. The PCR cycling conditions were 50 °C for 2 min for UNG activity, 95 °C for 10 min to activate the polymerase, followed by 40 cycles of annealing and extension step at 95 °C for 15 s and 60 °C for 60 s. Expression levels of IL-6 were normalized to GAPDH level and relative quantification of the IL-6 gene was performed using the 2−ΔΔCt method. All presented experiments were repeated at least three times. The results are expressed as the mean ± SD from the indicated number of experiments. Comparisons were made using Student’s t-test and one way analysis of variance. Differences between experimental groups were considered to be statistically significant at p < 0.05. Derivative of alloxanthoxyletin was obtained using two different methods. The first approach started with the reaction of 5,7-dihydroxy-4-methylcoumarin with 4,4-dimethoxy-2-methylbutan-2-ol. Application of the two-step crystallization yielded two products: 7-hydroxy-5,5a′,9-trimethylpyrano[2′,3′-f]-(2 H)-chromen-2-one (derivative of alloxanthoxyletin) (from benzene) and 7-hydroxy-5′,5a′,9-trimethylpyrano[2′,3′-f]-(8 H)-chromen-2-one (from methanol), however such method of synthesis was relatively time-consuming. In the second approach we have used the same substrates but under microwave conditions. Despite the need to use column chromatography such approach allowed us to obtain the products much faster. Synthesis and characteristic of the alloxanthoxyletin derivative was described before (Ostrowska et al. 2017). Alpha lipoic acid (±1,2-Dithiolane-3-pentanoic acid) was used as a second substrate for synthesis and it was supplied from Sigma Aldrich. The synthesis was carried out under room conditions in 1,4-dioxane and BOP ((Benzotriazol-1-yloxy)tris(dimethylamino)phosphonium hexafluorophosphate) was used as a catalyst. Synthesis of α-lipoic acid ester of 7-hydroxy-5′,5a′,9-trimethylpyrano[2′,3′-f]-(2 H)-chromen-2-one (LAA) is shown in Scheme 1. The purpose of this study was to evaluate cytotoxic activity of the synthetized ester of α-lipoic acid and derivative of alloxanthoxyletin (LAA). Applied tests were conducted on normal cells: human immortal keratinocyte cell line from adult human skin (HaCaT) and two tumor cell lines: human melanoma cell line (HTB-140) and human epithelial lung carcinoma cell line (A549). As reference compounds two commonly used anti-cancer drugs: cisplatin and doxorubicin were used. The cytotoxic activity of the tested derivative LAA was specified by determining the IC50 (inhibitory concentrations), i.e., the concentrations of a test compound, which inhibited cells’ viability and growth by 50% as compared to the controls. 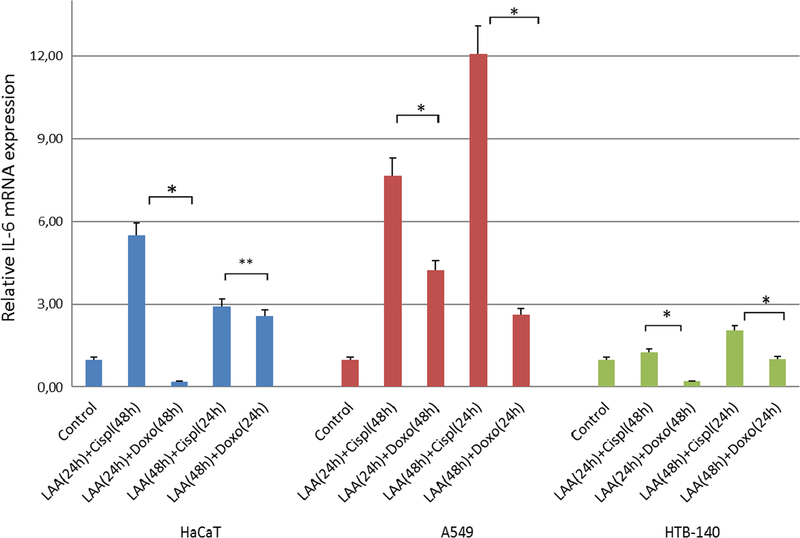 IC50 presented in Table 1 indicates that tested compound LAA was less toxic to HaCaT (normal) human cells than to cancer cell lines. 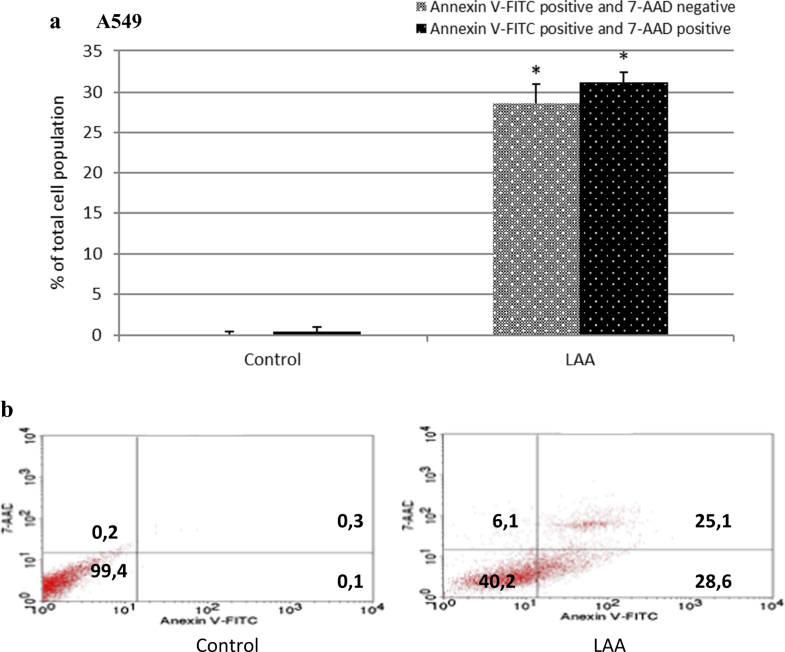 Studied LAA showed cytotoxic potential against HTB-140 and A549 cells with IC50 of 34.10 and 37.20 μM, respectively (Table 1). Moreover, 7-hydroxy-5′,5a′,9-trimethylpyrano[2′,3′-f]-(2 H)-chromen-2-one) served as a starting compound in the synthesis of LAA exhibited lower cytotoxicity than LAA against both tumor cell lines, with IC50 values 43.97 toward the HTB-140 cell lines, and with IC50 values 57.82 toward the A549 cell lines (For rev. see: Ostrowska et al. 2017). To express a cytotoxic capacity of the LAA against cancer cells a selectivity factor (Selectivity Index, SI) was determined (Badisa et al. 2014). SI values higher than 1.0 indicates, that the substance expresses a higher toxicity against the cancer cells than against the normal cells. It was recognized that the selectivity index (SI) for the ester of α-lipoic acid and derivative of alloxanthoxyletin (LAA) was similar to that observed for the reference chemotherapeutics in the A549 cells (Table 1). Assessment of the LDH release as a marker of cell death showed that α-lipoic acid ester of alloxanthoxyletin (LAA) at the concentration of 80 µM expressed strong cytotoxicity against studied cell lines and in the case of tumor cells the effect was greater (Fig. 1). Moreover, tested LAA significantly (p < 0.001) inhibited cell migration and this effect was stronger on HTB-140 and A549 cells than on HaCaT cells (Fig. 2). LAA at a concentration of 20 μM inhibited the A549 cell migration by 39.5%, HTB-140 cell migration by 47.9% and HaCaT cell migration by 35.7%. When compound was used at a concentration of 40 μM, the A549 cell migration was inhibited by 49.2%, HTB-140 cell migration by 56.4%, HaCaT cell migration by 47.9% (Fig. 2). In order to check whether the synthetized α-lipoic acid ester of alloxanthoxyletin (LAA) induces apoptosis in cells, we performed annexin V-FITC/7-AAD flow cytometry analysis. This assay identifies early apoptotic cells, and late apoptotic and necrotic cells. Cells that are stained positive for annexin V and negative for 7-AAD (shown at the lower right quadrant in Figs. 3–5) are early apoptotic. 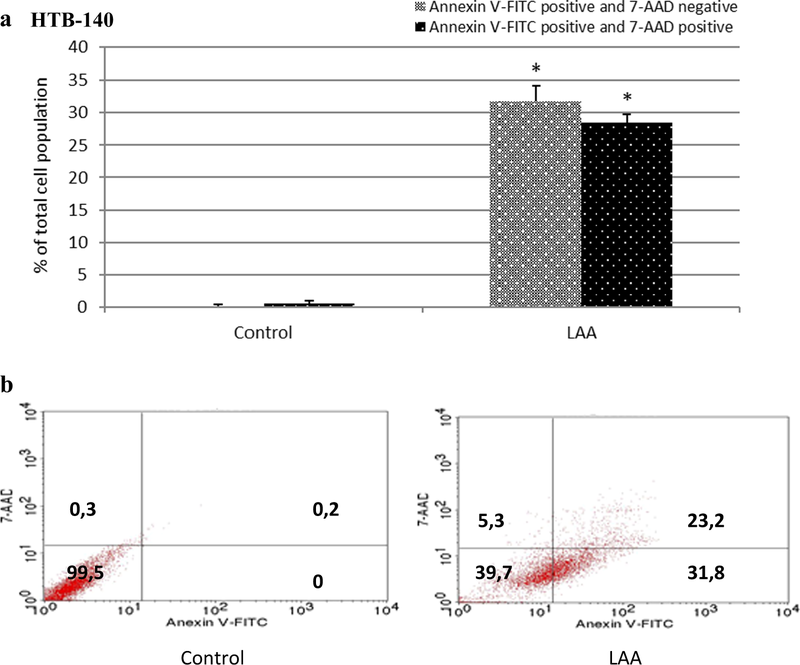 The incubation of HTB-140 and A549 cells for 72 h with LAA resulted in more than 1,5-times higher percentage of early and late apoptotic cells as compared to HaCaT cells. The tested alloxanthoxyletin derivative (LAA) induced early apoptosis in about 30% of cancer HTB-140 and A549 cells and in about 18% of normal HaCaT cells (Figs. 3–5). In vitro drug sensitivity testing in HaCaT, HTB-140, and A549 cells were also performed. Cells were pre-incubated with LAA for 24 or 48 h and then incubated with a chemotherapeutic agent (cisplatin or doxorubicin). The effect of the tested LAA on drug-induced cell death was higher in tumor cells (HTB-140, A549) than in normal cells (HaCaT) (Fig. 6). In order to confirm the obtained effect, we decided to check the influence of α-lipoic acid on the examined cells in combination with cytostatics (cisplatin or doxorubicin). Preincubation of the cells with LAA increased a sensitivity of tumor cells to a drug-induced cell death (Fig. 6) more effectively than preincubation of the cells with α-lipoic acid. In cancer cells the strongest effect was observed in HTB-140 cells. Pre-incubation of these cells with LAA for 24 h and then with cisplatin for 48 h resulted in a reduction of cell viability to 54.7 ± 3.1% (Fig. 6). When doxorubicin was added, after addition of LAA for 24 h, cell viability was reduced to 44.4 ± 6.5%. Thus, incubation with LAA (24 h) and then with doxorubicin (48 h) seems to be the most effective protocol. When A549 cells were pre-incubated for 24 h with our derivative LAA their viability was also significantly decreased to 55.4 ± 2.6% in experiments with cisplatin, and to 47.2 ± 5.4% in experiments with doxorubicin. We hypothesize that reducing the time of exposure to cisplatin or doxorubicin by formulating protocol of incubation with LAA (24 h) and then with chemotherapeutic agent (48 h) can reduce the side effect of chemotherapy on HaCaT cells while preserving its cytotoxicity against HTB-140 and A549 cells. However, chemotherapeutic agents can not only induce tumor cell apoptosis but also trigger inflammation in the tumor microenvironment. Proinflammatory factors, such as IL-6 are involved in multi drug resistance. It has been shown that increased IL-6 gene expression correlates with poor prognosis and chemoresistance (Wang et al. 2010; Gao et al. 2016). Thus, in the present study, the effect of addition of LAA, before incubation with commonly used anticancer drugs (cisplatin and doxorubicin), on the IL-6 mRNA expression was investigated (Fig. 7). Reduced IL-6 mRNA expression in experiments with doxorubicin compared to cisplatin was observed in A549 and in HTB-140 cells (Fig. 7). Significantly lower expression of IL-6 mRNA was observed in A549 cells which were pre-incubated for 24 h with LAA and then treated with doxorubicin for 48 h as compared to the cells pre-incubated with LAA for 24 h and then treated with cisplatin for 48 h. Furthermore, in this therapy the cell viability was also significantly reduced, Fig. 6. As shown in Fig. 7 the proposed therapy in HTB-140 cells was associated with a significantly lower IL-6 mRNA expression levels when compared with A549 cells. The greatest effects on lowering expression of IL-6 in HTB-140 cells has pre-incubation for 24 h with the tested compound LAA and then treatment with doxorubicin for 48 h. Therefore, this therapy may be a promising strategy of treatment human melanoma and modulation of IL-6 expression, as well as its related signaling pathways. Both, the cytotoxicity and the migration tests showed that human melanoma cells (HTB-140) and human lung cancer cells (A549) were sensitive to newly synthetized ester of α-lipoic acid and alloxanthoxyletin. 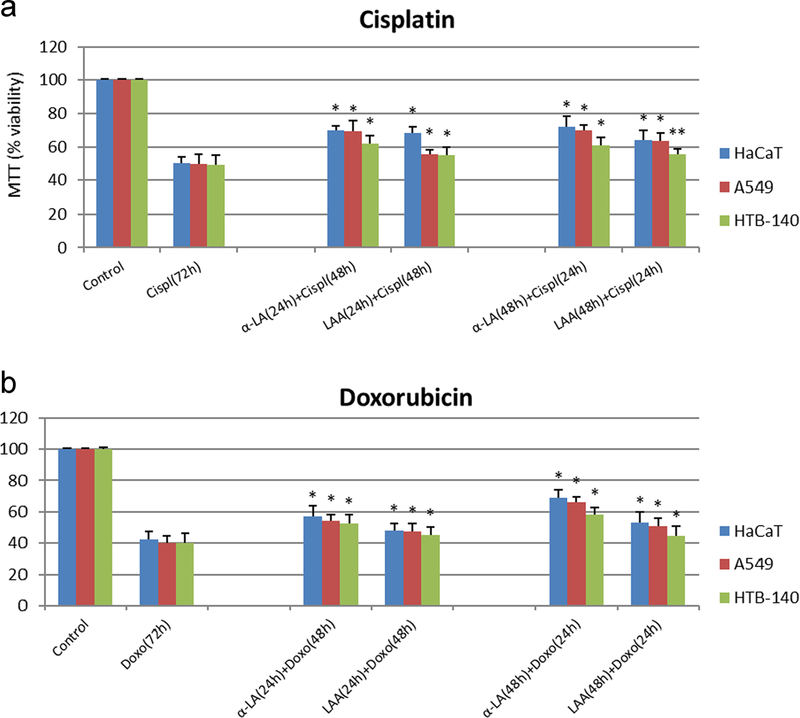 The tested compound induced apoptosis in the cancer cells and increased a sensitivity of tumor cells to a drug-induced cell death in experiments with cisplatin and doxorubicin, where exposure time to chemotherapy was reduced from 72 h to 48 h. Moreover, incubation of the A549 and HTB-140 cells with LAA, prior to addition of doxorubicin, was associated with higher reduction of IL-6 mRNA expression than incubation of the cells with LAA, prior to addition of cisplatin. The results suggest that the compound is promising for potential future applications, but further studies are needed to confirm these results and gain more insight into the mechanism of action of tested derivative. The online version of this article ( https://doi.org/10.1007/s00044-019-02335-3) contains supplementary material, which is available to authorized users. This work was supported by the Medical University of Warsaw and carried out with the use of CePT infrastructure financed by the European Union-the European Regional Development Fund within the Operational Programme Innovative Economy for 2007–2013. This work was supported by the Polish National Science Centre under the grant PRELUDIUN number UMO-2017/25/N/NZ7/01583 and the statutory founds of Department of Biochemistry and Pharmacogenomics and Chair and Department of Biochemistry, Medical University of Warsaw. We would like to thank Mr Marek Głowala from the Medical University of Warsaw for the technical assistance.